Your current location： Home > Mall News > Industry News > Are the Major DRAM Suppliers Stunting DRAM Demand? in January 2017. 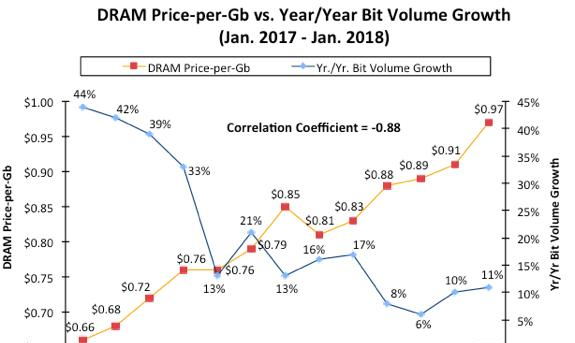 There is little doubt that electronic system manufacturers are currently scrambling to adjust and adapt to the skyrocketing cost of memory.DRAM is usually considered a commodity like oil. Like most commodities, there is elasticity of demand associated with the product. For example, when oil prices are low, many consumers purchase big SUVs, with little concern for the vehicle’s miles-per-gallon efficiency. However, when oil prices are high, consumers typically look toward smaller or alternative energy (e.g., hybrid or fully electric) options. January 2017 through January 2018 was a strong -0.88 (a perfect correlation between two factors moving in the opposite direction would be -1.0). Thus, while system manufacturers are not scaling back DRAM usage in systems currently shipping, there have been numerous rumors of some smartphone producers scaling back DRAM in next-generation models (i.e., incorporating 4GB of DRAM per smartphone instead of 5GB). 2018 edition of The McClean Report is priced at $4,290 and includes an Internet access password. A multi-user worldwide corporate license is available for $7,290.